Using A572, GR. 50, IS-2062 Grade A, En-8, En-19 material as per IS-1367 Class 8.8 / Class 10.9 or as per the requirement of the customer. Manufactured as per IS-5624, DIN 267, and DIN 529 with 2 nuts & washers Type A, B, C, D.
J Type / L Type Foundation Bolts with Class 8 nut, 1 washer and 1 lock nut. Plate Type Foundation Bolts with 1 nut & 1 washer. Long length (up to 6000 mm) Rock Bolts in Torr-Steel with 1 nut & 1 washer. Rail Track Foundation Bolts with 1 nut, 1 washer, 1 spring washer. 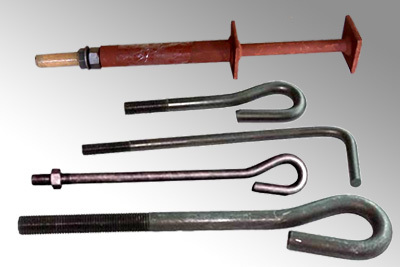 Other Foundation Bolts as per specific requirement & drawing.